Instant downloads of all 942 LitChart PDFs (including Watership Down). Welcome to the LitCharts study guide on Richard Adams's Watership Down. Created by the original team behind SparkNotes, LitCharts are the world's best literature guides. A concise biography of Richard Adams plus historical and literary context for Watership Down. A quick-reference summary: Watership Down on a single page. In-depth summary and analysis of every chapter of Watership Down. Visual theme-tracking, too. Explanations, analysis, and visualizations of Watership Down's themes. Watership Down's important quotes, sortable by theme, character, or chapter. Description, analysis, and timelines for Watership Down's characters. Description, analysis, and timelines for Watership Down's terms. Explanations of Watership Down's symbols, and tracking of where they appear. An interactive data visualization of Watership Down's plot and themes. Richard Adams was born in the English countryside—an evocative, lush place he would later use as the setting for his most famous novel, Watership Down. The son of a well-to-do doctor, Adams attended the prestigious Oxford University, though his education was interrupted when he was called to serve in the British Army during World War II. After leaving the army in 1946, Adams finished his degree at Oxford and went on to join the British Civil Service, eventually working in the Department of the Environment. He had a love for storytelling, and when he began telling a story about a group of rabbits to his two young daughters, they urged him to write the tale down. Adams wrote Watership Down and began sending it to agents and publishers; it was rejected several times before at last being acquired by a publisher named Rex Collins. The book sold a million copies worldwide in its first few years in print and has gone on to become recognized as a modern classic. Adams was the writer-in-residence at universities in England and the U.S. and also became active in the Royal Society for the Prevention of Cruelty to Animals. Adams continued writing all his life. He and in December of 2016 in Oxford at the age of 96. 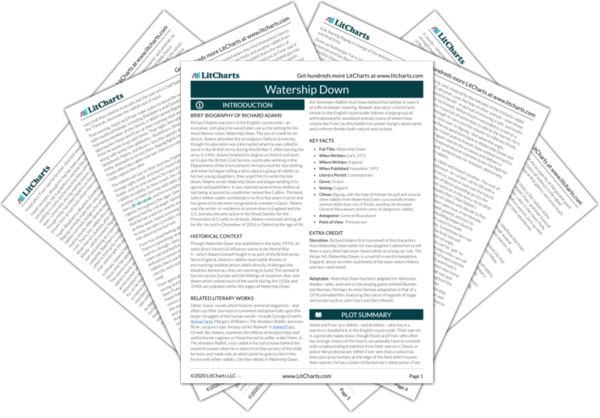 Get the entire Watership Down LitChart as a printable PDF. Though Watership Down was published in the early 1970s, its most direct historical influence seems to be World War II—which Adams himself fought in as part of the British army. Set in England, Adams’s rabbits must battle threats of encroaching totalitarianism which directly challenges the idealistic democracy they are working to build. The spread of fascism across Europe and the feelings of suspicion, fear, and doom which seized much of the world during the 1930s and 1940s are palpable within the pages of Watership Down. Other classic novels which feature animal protagonists—and often use their journeys to comment metaphorically upon the larger struggles of the human world—include George Orwell’s Animal Farm, Margery Williams’s The Velveteen Rabbit, and even Brian Jacques’s epic fantasy series Redwall. In Animal Farm, Orwell, like Adams, examines the effects of dictatorships and authoritarian regimes on those forced to suffer under them. In The Velveteen Rabbit, a toy rabbit is forced to leave behind the world he knows when he is taken from the nursery of the child he loves and made real, at which point he goes to live in the forest with other rabbits. Like the rabbits in Watership Down, the Velveteen Rabbit must leave behind the familiar in search of a life of deeper meaning. Redwall, also set in a forest land similar to the English countryside, follows a large group of anthropomorphic woodland animals (many of whom have visions like Fiver) as they battle evil, power-hungry adversaries and confront threats both natural and societal. Climax: Bigwig, with the help of Kehaar the gull and several other rabbits from Watership Down, successfully breaks several rabbit does out of Efrafa, avoiding the dreaded General Woundwort and his army of dangerous rabbits. Storytime. Richard Adams first conceived of the characters from Watership Down when his two daughters asked him to tell them a story they had never heard while on a long car ride. The titular hill, Watership Down, is a real hill in north Hampshire, England, about six miles southwest of the town where Adams was born and raised. Adaptable. Watership Down has been adapted for television, theater, radio, and even a role-playing game entitled Bunnies and Burrows. Perhaps its most famous adaptation is that of a 1978 animated film, featuring the voices of legends of stage and screen such as John Hurt and Zero Mostel. Tanner, Alexandra. "Watership Down." LitCharts. LitCharts LLC, 7 Feb 2019. Web. 21 Apr 2019. Tanner, Alexandra. "Watership Down." LitCharts LLC, February 7, 2019. Retrieved April 21, 2019. https://www.litcharts.com/lit/watership-down.